Mughal emperor Jahangir. During his reign Orchha reached the height of its political power and saw its greatest architectural development. This is a general view of a minor palace on the island, the Sawan Bhadon, named after a monsoon month. It has a white balcony with another long balcony enclosed by jali screens running around the upper level. In the left foreground are twin towers and in the background are the domes of the Jahangir Mandir, one of three main palaces at Orchha built in c.1605 by Bir Singh Deo. The photograph is from an album containing architectural and landscape studies of various sites in Central India. The majority were taken by Deen Dayal while on tour with Sir Lepel Griffin (1838-1908), who served as Resident at Indore and Agent to the Governor-General of Central India between 1881 and 1888. Many are reproduced in autotype in his ‘Famous Monuments of Central India’ (London, 1886). 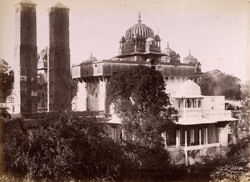 This photograph is similar to plate 74, 'Oorcha Fort'. The album was formerly in the collection of Sir William Lee-Warner (1846-1912), who served in the Indian Civil Service and was a Member of the Council of India between 1902 and 1912.